A local goose told reporters that it was a great relief to be promoted to lead the “V” after years of toiling at the back of the configuration. 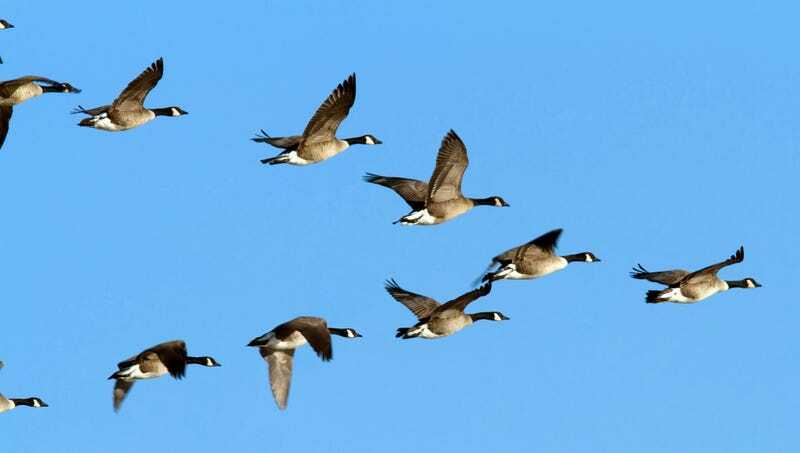 Sources confirmed the giant Canada goose, who has reportedly been eyeing a position at the front of the flight formation since his very first migration, has shown great promise in his six years with the flock, slowly moving up from his initial posting on the left side of the V at the very back. While stressing that he was proud of his journey to the V’s tip, the goose conceded there were times over the years when he had been forced to “keep [his] bill shut” and watch as younger, less-skilled geese were promoted ahead of him. As recently as 2015, he was still flying what he described as dead-end assignments in the middle of the formation. The goose remarked that during this period, he was “feeling pretty check out” and spent several migration cycles just going through the motions of flapping and honking. According to the goose, his lowest point came after he was passed over for a plum position as second-on-the-right, losing out to an inexperienced rival whose uncle was then heading the flock. He said he had assumed he would be a shoo-in for the job after he had won the approval of his fellow geese by spotting, from 3,000 feet above, a group of Binghamton, NY school children handing out bread crumbs in a local park. Feeling that his efforts were going unappreciated by his superiors, the goose reportedly considered quitting altogether and starting a gaggle of his own out in California. Now that his fortunes have changed, the goose said he was glad he chose to stick it out, though he acknowledged the new position comes with its share of challenges. The member of the Branta canadensis species went on to state that he is eager to implement many of the ideas he has for improving the block’s migratory habits—such as heading south a few weeks earlier each year and increasing altitude to add more coasting opportunities—as he believes his innovations could greatly improve the efficiency with which the flock operates. However, some flock members have expressed misgivings about the new bird occupying the tip of their V, with one goose saying she fears he lacks the instincts necessary for the top position. “After all, he wouldn’t have gotten this job in the first place if the three guys in front of him hadn’t been sucked into the engine of a passenger jet,” she added.